As evidence has mounted that Russia intervened in the U.S. election to support the Trump campaign, President Trump has been arguing that he has been tougher on Russia than President Barack Obama was. He even suggested that Attorney General Jeff Sessions investigate Obama for an alleged failure to take action. Never mind that during the campaign — or for months afterward — Trump repeatedly dismissed or belittled reports of Russian interference. In his tweet, Trump demanded a “look at the facts,” so let’s see whether he has a case for toughness. The answer is not necessarily clear. It depends on whether one looks at presidential tone or the administration’s actions. Obama, much like Trump, entered office seeking to improve relations with Russia, even to the point that Secretary of State Hillary Clinton presented the Russian foreign minister with a button marked with what was meant to be the word “reset” (with the word misspelled in Russian). Vladimir Putin, because of term limits, was forced to step down as president, and Obama thought he had forged a connection with Dmitry Medvedev, who filled the one-term gap before Putin returned to the presidency. The United States and Russia completed a nuclear-weapons agreement, and Obama paved the way for Russia to join the World Trade Organization. The Obama administration also initially pushed back against congressional efforts to pass the Magnitsky Act, intended to punish Russia for the death of tax accountant Sergei Magnitsky in a Moscow prison in 2009, out of fear that it would derail the reset effort. But Russia’s military intervention in Ukraine and swift annexation of Crimea in 2014 stunned the Obama administration and led to a much tougher stance. Within months, the administration announced the European Reassurance Initiative, designed to bolster forces in Europe and enhance deterrence. The administration also imposed sanctions on Russia over the incursion, building on the Magnitsky Act. During the 2016 election campaign, the Obama administration raised alarms over possible interference by Moscow. Just weeks before the election, the administration announced that Russia was behind the hacking of the Democratic National Committee. On Dec. 29, 2016, Obama imposed sanctions, including the expulsion of some three dozen Russian diplomats and intelligence officials and the closure of diplomatic compounds. So under Obama, U.S.-Russian relations started with optimism and went into a downward spiral. What about under Trump? Trump’s positive rhetoric about Putin has continued, but behind the scenes, his administration has acted like a tough-minded Republican administration. White House press secretary Sarah Huckabee Sanders, defending the president’s tweets, cited a number of actions that she said showed Trump had been “extremely tough” on Russia. The list included bolstering annual defense spending to $700 billion by eliminating the defense sequester, exporting energy to Eastern Europe, and arming Ukraine with lethal weapons such as antitank missiles. The State Department also closed three Russian diplomatic posts in San Francisco, Washington and New York after Russia finally retaliated against Obama’s election-related sanctions. There is merit in this argument. (One could also add the proposed bolstering of nuclear forces in the recently released Nuclear Posture Review.) It is possible that a Hillary Clinton administration might have taken somewhat similar steps, since these resemble a continuation of Obama administration policies. But, nevertheless, these actions represent a toughening of the U.S. stance and certainly do not make Russia happy. But is this because of presidential directives or simply the initiatives of Russia hard-liners sprinkled throughout the administration? Trump, for unexplained reasons, personally has been weak in responding to the actions attributed to Russia during the election. Congress, with veto-proof majorities, in 2017 passed the Countering America’s Adversaries Through Sanctions Act, which imposed sanctions on Russia. Trump only grudgingly signed it, calling it “seriously flawed” because he said it limited his flexibility. “This bill makes it harder for the United States to strike good deals for the American people,” he said in a statement. Moreover, the administration then refused to implement the sanctions as scheduled, on the grounds that the mere passage of the law had already served as a deterrent. Trump has also highlighted Putin’s denial of any involvement, even though intelligence officials say such an operation could only have been undertaken with Putin’s approval. Even after special prosecutor Robert S. Mueller III announced the indictment of 13 Russians for seeking to influence the election, Trump has yet to criticize or fault Russia — or Putin — for the election-year activities. One often has a sense that Trump operates independently of the vast government he oversees. The administration certainly has taken steps that represent a toughening of the Obama administration’s policies, such as the supply of lethal weapons to Ukraine. But Trump himself has continued with rhetoric and tone that suggests he still wants to be Putin’s friend. He cannot bring himself to fault Russia for its actions, instead accusing Obama of not doing enough to thwart Russia. It certainly took Obama many years to become a Russia skeptic. 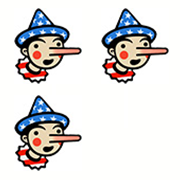 But when it comes to being tough on Russia for its election activities, Trump falls short of the actions taken by Obama, especially when he frames it as: “I have been much tougher.” We wavered between Two and Three Pinocchios, but Trump’s use of the personal pronoun tips us to Three.